When are the UK data releases and how could they affect GBP/USD? The UK docket has the monthly and quarterly GDP releases today for the third quarter, alongside the trade balance and industrial production, all of which will be published later this session at 0930 GMT. The United Kingdom GDP is expected to arrive at 0.1% m/m in September while the first readout of the Q3 GDP is seen at 0.6% q/q and 1.5% y/y. Meanwhile, the manufacturing production, which makes up around 80% of total industrial production, is expected to show m/m growth of 0.1 % in September, up from a contraction of 0.2% recorded in August. The total industrial production is expected to come in at 0.1% m/m in Sept as compared to the previous reading of 0.2%. On an annualized basis, the industrial production for Sept is expected to have dropped 0.5% versus 1.3% previous, while the manufacturing output is also anticipated to have dropped 0.4% in the reported month versus 1.3% last. Separately, the UK goods trade balance will be reported at the same time and is expected to show a deficit of £11.250 billion in June vs. £11.195 billion deficit reported last. Readers can find FX Street's proprietary deviation impact map of the event below. 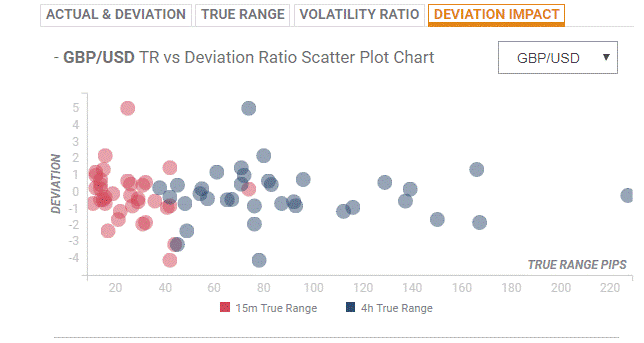 As observed the reaction is likely to remain confined around 20-pips in deviations up to + or -2, although in some cases, if notable enough, a deviation can fuel movements in excess of 60-70 pips. The upbeat UK GDP figures could offer the much-needed respite the GBP bulls, but it could be a temporary relief, as the Brexit deal jitter will continue to undermine the sentiment around the pound. The Gross Domestic Product released by the Office for National Statistics (ONS) is a measure of the total value of all goods and services produced by the UK. The GDP is considered as a broad measure of the UK economic activity. Generally speaking, a rising trend has a positive effect on the GBP, while a falling trend is seen as negative (or bearish). The Manufacturing Production released by the Office for National Statistics (ONS) measures the manufacturing output. Manufacturing Production is significant as a short-term indicator of the strength of UK manufacturing activity that dominates a large part of total GDP. A high reading is seen as positive (or bullish) for the GBP, while a low reading is seen as negative (or bearish). The trade balance released by the Office for National Statistics (ONS) is a balance between exports and imports of goods. A positive value shows trade surplus, while a negative value shows trade deficit. It is an event that generates some volatility for the GBP.